Oil painting has many aspects - and it's best to learn them one by one. There are beginner oil painting methods that guarantee immediate realistic results (you know, the famous ones). They are most helpful but when you gain your own skills, one at a time, you also develop your own style. You’ll be better able to handle your own subject material. Part of painting is actually drawing. It's always good to practice that, with a pencil and notebook, for example during a meeting or class. The point of it is not to make finished gallery works, but note down ideas, determine proportions and the way space organizes itself around your subject. In drawing you organize your perception. After that, the shift from drawing to painting is only a shift from making 'lines' to making 'fields'. I’ve picked a list of 7 colors that will give you a complete range of hues. They are very helpful in beginner oil painting. If you start with them, you will learn fast about how to mix colors. Earth colors can be bought later. 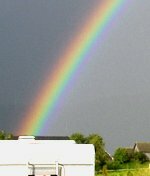 Click here for the list of colors. There are three main issues in learning to paint: handling light-and-darkness, handling color, and learning to draw - which can be replaced by photography. But real drawing skills are an asset (drawing can also be practiced by painting in black and white - scroll down). For learning colors, you need some basic color theory, and then you're good to go. 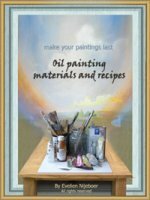 Basic material info – or, how to make your oil painting stand the ages. Before using color, it’s good to paint in black-and-white for a while. In the beginning, it's good to only focus on light-and-dark, and on different kinds of brushing. Just for a while, untill you understand light and darkness, it's good to paint with only black and white paint (or, dark brown and white). You’ll see, that these aspects are very interesting on themselves. And the good thing is: black and white paintings can always be colored later - the ancient greek used to work this way. It enables you to build up an oil painting in the beginner’s way: dealing with one visual ‘issue’ at a time. Another way to start is, abstract with pure, prismatic colors. In this way you'll learn colors first. For painting realistic in colors, you'll need to learn some color theory, but there are methods available to help you learn that fast and easy (click here). For realism, underpainting also is a valuable tool. It chops up the process in portions (layers) that are easier to manage. There are roughly two kinds of beginning oil painters: the ones who like to do studies and have some structure - and the ones who really need to find out for themselves. Do you favour a direct do-it-yourself approach? Start with the colors, or with working abstract in black and white (putting the colors on later). If you want to do more realistic studies: you could take a photograph that you like, copy it in black and white, and try to paint it, at first only with black (or burnt umber, dark brown) and white. For learning realistic colors I can really recommend the color theory course by Richard Robinson. If you take this course, and learn some drawing or proportions as well, you can call yourself a decent painter. For your artistic development, best of all is to swap between freestyle experiments, and structured studywork. In this way, you’ll learn fast. During your artistic process, sometimes you have to accept the fact you need to practice, in order to learn. Beginner oil painting is a learning process - he result is not always on the canvas. The result or your work may also be: you, gaining a skill. I learned most from the paintings I considered as failures, and often I picked them up later to make something good out of it. For results it's easier to start all over on a fresh canvas - but for your learning process, it’s better to “mend” a mistake, on the canvas where you made the mistake. The work itself will look like a beginner oil painting - a bit dense - but you will gain the most skill from mending your own mistakes. Here are some beginners’ traps to avoid. Knowledge is power! A limited palette gives a characteristic look and feel. Pick a few colors to set up your painting with. Try to use them to their full extent (with or without black and white, mixed, transparant and opaque). Only add others, if you really need certain accents. If you want to use photgraphs: copy it in black and white, and fill in the colors yourself. You can draw a raster on it, to take over proportions. And: pick out the elements you like, and leave other stuff out. Tonal values are just as important as colors. Look at your work through your eyelashes, then you’ll only see the light and darkness, like a black and white picture. Or take a photo of it, and desaturate it in the computer. There should be a range of shades, some livelyness and variation, and also a kind of balance. If you change subject during the process, do it only for a good reason, otherwise you’re likely to get lost. Your subject can be realistic or abstract. In both cases, it defines the purpose of your work, and purpose should be a stable factor. It helps you decide if you’re satisfied, and when the painting is finished. There are exceptions to this rule - when happy accidents or other really interesting things occur, allow yourself to follow the lead. Don't be afraid too much of losing what you have. You can always start again on your subject on another board or canvas. Beginner oil painting is not always elegant right away, but fiddling, forging solutions, or galloping enthousiasm can ruin good work. Besides that, your concentration ends somewhere. Each painting session has a start, a middle and an end - keep in touch whith that. While you’re working, there is a turning point where you lose concentration, or where actual work turns into “fiddling”. Learn to recognize that point, and quit working immediately, even if you’re not happy yet. Chances are, you’ll be very surprised with your work when you see it the next day. If not: oil painting is a patient medium. See your painting as background material and paint over it. Block parts of the picture with your hand stretched ahead of you. If the picture gets better when a certain spot is blocked out, you’ve located the problem. Check here for more of this kind of oil painting tips. Besides painting, photography is a great perception training - you frame, make compositions, and while you're at it, you might actually use these photo's to make great paintings later. A simple camera will do. You might consider Snapfish.com for taking care of your prints. Also good training: doodling. Have a notebook and pencil always at hand, and practice your drawing skills during lunch hours. Put another painting next to it. Is it better or worse than the other? You'll see it right away. This is what I do to see if a painting is finished. Put it upside down and look at it as an abstract painting. How is the balance, the tonality, are there dead spots? Put a frame on it, as if it’s finished. You can do that with a piece of paper with a rectangle cut out. Make sure the proportions are the same as you canvas. Keep it somewhere in front of you, and look through it at your painting. If you have photoshop (or the free version: Gimp), it's eaiser to plan layers ahead. Take a picture, and try out the stuff you want to do - on the computer. Sometimes the best medicine is: time. Sleep on it, or better: forget the work for a few days. If you do that profoundly, you’ll have a fresh look at it a few days or weeks later. The very best way to get a fresh look, is to put up your work in an exhibition. If you want to become a pro, do that at least once a year. Ponder a bit about the kinds of art you like. What’s the kind of art YOU want to see? That’s what you should make. If there's an artist who's work you really like, do some study by imitating his/her work. 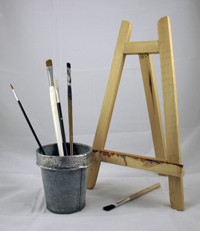 Beginner oil painting is a matter of practicing and learning skills. A good way to do that, is to imitate a painting of an artist that you like. Painting has been learned this way for ages.